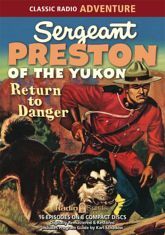 Danger lurks around every snowbank as intrepid Sergeant Preston of the Northwest Mounted Police races into action behind his courageous sled dog Yukon King! Get set for eight hours of thrill-packed adventures in the Frozen North. Brace Beemer (better known to most listeners as The Lone Ranger) stars as Sergeant Preston in sixteen consecutive broadcasts from the last season of the program - including previously unavailable episodes!